Arto Järvelä came from Finland to Chicago to be a fiddler-in-residence at the Old Town School of Folk Music for the month of September 2009. He was given a room at the Tyler house on Kostner Avenue, and quickly became part of the family. What great music we had, matched by deeply interesting cultural exchange and marvelous conversation. Patsy (the dog) got the best part, as Arto spoke to her daily in Suomi. What secrets he told her, she has not yet shared. Here's some of the music played in our living room. 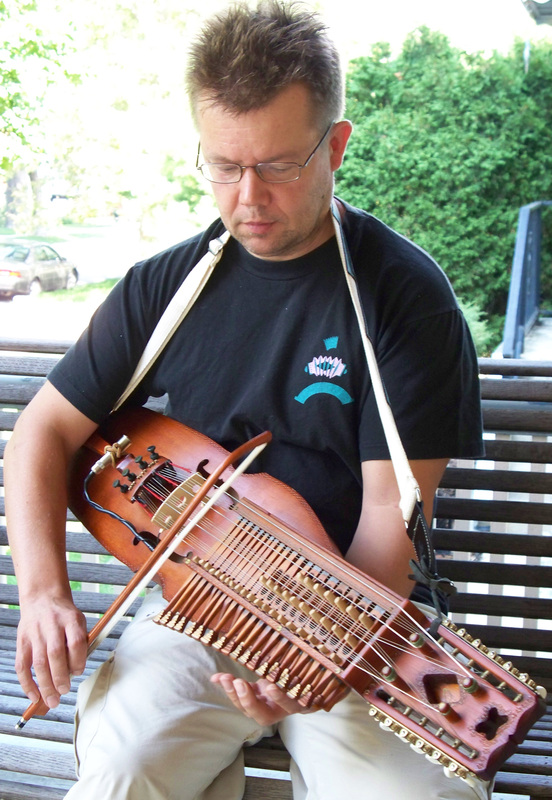 The sound of Arto's nyckleharpa still resonates in our living room. One day, Steve Rosen came over to give Arto a clawhammer banjo lesson and learn some tunes. Arto introduced us to the purppuri (potpourri or suite) of eleven tunes traditionally played at a wedding in Kaustinen and nearby Ostrobothnian villages. Arto Järvelä began his stay with a workshop on Archaic Finnish Tunes and ended it with another on Modern Finnish Tunes. Here are some highlights from those workshops, plus the tunes he taught at the various Fiddle Classes he visited each week. For the First Friday dance at the School, we tried our hand at the Huutokatrilli, the called quadrille that culminates the Saturday night program at the Kaustinen Folk Festival. Arto's band, JPP, arranged and recorded a medley of old Finnish quadrille tunes for the event. Also, During his stay, Arto became a member of the Fantastic Toe Trippers Orchestra. He taught us these tunes as we rehearsed in the garden at St. Matthias Church. First Friday Huutokatrilli or "night quadrille"
Huutokatrilli rehearsal, with Walter Hojka on piano. I called the dance for 8 to 10 couples later that night. the dance group at the Finnish Cultural Center in Detroit.